Home › Black Solar Panels › Buy black solar panels in Australia – cost, review & more. Today we’ll take a look at black solar panels. How do they perform compared to conventional panels? What are the best brands? And where can you buy them in Australia if you’re so inclined? Canadian Solar’s robust All-Black panels (CS6K-MS modules – click for datasheet) with 60 solar cells are specifically targeted for consumers in the residential market. Sunpower’s residential solar panel X-Series are, according to their website, offered in SunPower® Signature™ Black, “designed to blend harmoniously into your roof.” Built using all-black solar cells and anti-reflective glass to reduce glare, the premium aesthetics can accommodate a variety of architectural styles. Note that they didn’t mention performance at all – but if ‘premium aesthetics’ are important to you then these could be worth checking out (the black panels have 10W less output). LG Solar’s NeON 2 solar panel comes in conventional colouring and also black. According to the datasheets the black panel is 4.4% larger in order to reach the 315/320 watt output of its less flamboyant solar sibling. Black solar panels are more expensive and perform slightly worse than blue solar panels. With that said, if looks are important to you some quality manufacturers have some options – you certainly can’t go wrong with LG or Sunpower – and if you have a surfeit of space on your roof the extra 4.4% isn’t going to be a big deal. Have you got any experience with black solar panels or would like to ask us any questions on them? Please sound off in the comments and we’d be happy to help. Are black solar panels less efficient? Solar cells can have polycrystalline cells, which have multiple crystals and appear blue, or monocrystalline cells, which are cut from one large crystal and appear much darker than the poly cells. The monocrystalline cells are more expensive and are the ones black solar panels are made out of. 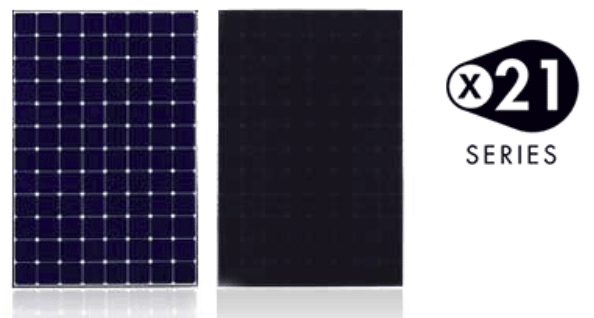 These solar panels are made when you use a black backing sheet instead of the conventional white and place the darker monocrystalline cells on it – the panel then appears black (or close enough). This is, however, only to do with aesthetics – you won’t get any better performance from a black solar panel. In fact, ironically enough solar panel performance degrades the hotter the module gets, and the black backing sheet absorbs more heat – so you’d want to make sure black is super important to you!